When I heard that Todd Jennings (a trail runner and generally great guy from nearby New York) that we met as part of the “Running on Empty” book event with Marshall Ulrich (a legendary ultra-endurance athlete), was putting on a new and challenging 50 mile ultramarathon, I recommitted. It was the perfect scenario – we wanted to support Todd, I wanted to back up my promise and I was in my “off year” for Ironman training (I’ve promised Lindsay to only go Iron-M-I-A every other year at most) so injury wouldn’t be AS big a concern. And as it turned out, there was to be no out….. At every turn something kept things within striking distance: Only 2 people want to do it? 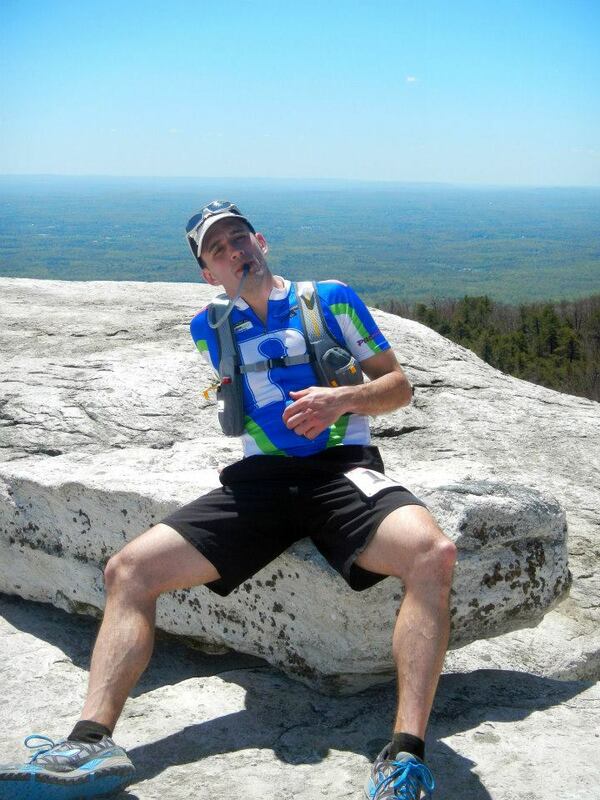 Nope – Joe G, and experienced ultra-endurance athlete who had joined the Pro-Activity staff was going to jump in. Can’t get a fourth person to fill out your roster? No problem, Todd is accepting teams of UP-TO four. Bottom line – nothing is stopping you……except you. “OK, I’m in”…..with lots of barriers. From the get-go my training seemed doomed. I just couldn’t find a great training groove. I’d get a few sessions in one week and think I was getting on track and then life would get in the way and I’d lose my momentum; I’d do a few miles and then some ache or pain would threaten; and the story went like that for a few months. All the while, I kept telling everyone that I was doing the race, that it was going to be ugly, but that I was doing it. By that point, I knew I wouldn’t back out, but I definitely didn’t feel confident or particularly strong either. I made absolutely sure that Joe and Nick both knew that I was going to need to go SLOW if we were going to pull this off and that I would be siphoning their experience to get through this adventure. My role was going to be the third wheel, the guy solely worried about getting enough sugar, salt and water into the bloodstream and keeping one-foot in front of the other until the end. They reassured me that they were cool with that strategy and that everything was going to be OK; and I kept trudging along through my training, not really paying close attention to the training data, just trying my best to get some level of consistency going. For the record, it’s a darn good thing I wasn’t paying too close attention to the data. After looking back through my data for the year, my longest run of the year prior to yesterday’s race was the “New Year’s Day Death Run” that a couple of my local training partners do each year. 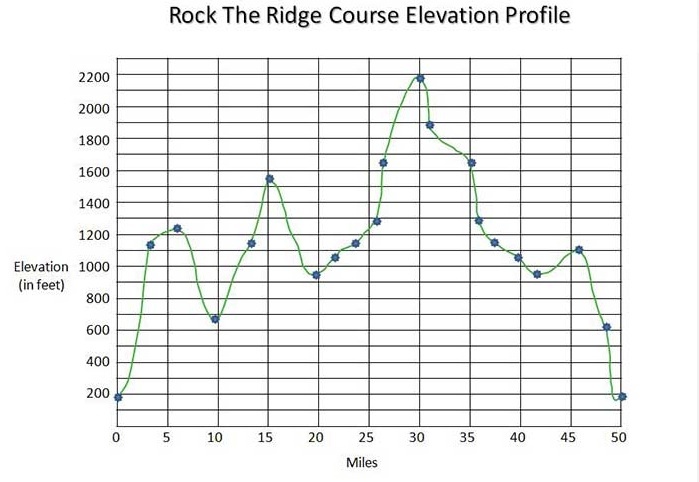 It’s a 15 mile, grueling route……but even that, at 15 miles is WAY short of the typical ultramarathon training plan which often has back to back days of 20 to 30 mile runs to build the resiliency needed. Yeah, so I was WAY short. Most marathons train a person to a 22 mile long-run at least. Not exactly the wisest training strategy……..
After a pre-race routine which mimicked the disorganized nature of my training (we were literally the last team to check in, about 15 minutes before the race was to start), I packed my final drop off bag, found the porta-john and got in line at the start. Joe said “are you sure you want to wear that?” referring to the long-sleeve fleece I was wearing. It was chilly, but I had been thinking of ditching it in my bag anyway, so that put my decision over the top. I stepped out of the crowd one last time, got rid of the sweatshirt and got back in time for the national anthem……and away we went. We started just as planned – SLOW – and a few groups got out in front of us. “Who cares” I thought, this is just about finishing. Within minutes I started to feel the effects of over-hydrating in prep……and within the next hour I stopped four times. I could feel my hands getting a little stiff and they looked a little puffy, a sure early sign that I had over-done my pre-race hydrating the previous two days and my electrolyte balance was not where it needed to be. Over-hydration can easily lead to hyponatremia (low salt), a very dangerous (and occasionally deadly) condition……so, since I didn’t want any piece of that, I needed to make some early shifts in my nutrition plan. Going in I had planned to get all of my calories in liquid form by mixing carbs with my fluids since it’s easier to process liquids than solids while racing. So whereas this is a great strategy in normal conditions, it unfortunately meant that I now couldn’t get fuel without getting fluid. Of course given my less than stellar previous experiences in ultra-distance events when my nutrition plan went south, I was trying to stay calm. This was WAY too early for things to start going wrong……. We made it to the food-aid station, and I decided I’d grab some solid calories (Cliff-brand “Shot Blocks” which I like but never use during races) in hopes to get some fuel in while the hydration situation leveled off. I had a soft-tortilla with peanut butter and another plain one on our way out of the station and I hoped I wouldn’t pay for it later. What most people don’t realize is that when you’re working hard enough (high-heart rate), you can’t process anything in your stomach and it just sits there eventually causing gastric issues…..thankfully for me, the slow pace was keeping my heart rate in check and the solids didn’t bother me. To add some insurance, I took in some salt to make sure I wasn’t getting “waterlogged” (hyponatremic). By mile 15 the water issue was settling and I hadn’t had to “go” for a while…..we made our way to an absolutely gorgeous section of the course with amazing views and kept on trucking. We did a few miles of up and down and the day was starting to get hot. I had actually developed a slight thirst, so I knew it was time to start putting fluids back in…….and all was well, I was over the day’s first major obstacle. So besides being woefully physically underprepared and mentally unsure of myself, barely making it to the start on time and running into a potentially devastating nutrition issue within the very first portion of the race, the day couldn’t have been off to a more beautiful start. The sun was shining and we were chugging along. Somewhere around mile 18 or 20 and we started to climb. 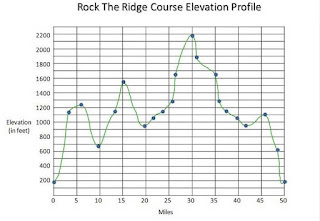 Of course the guys had mentioned that we had a solid 10 mile climbing section, but having not even looked at the race profile, I had no idea what to expect…..so we climbed and reached the second aid station which was somewhere near the 1/2 way point we got a little more fuel, filled our hydration packs and headed back out to continue to climb…..and climb…….and climb. Over the next 12 to 13 miles we trudged up to the very top of the race course. It took what felt like an eternity, the sun was starting to beat down some and we kept trudging along. 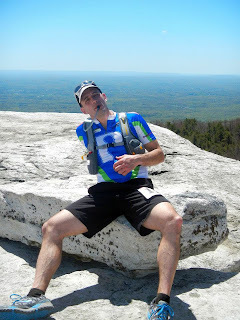 We finally go to the top (somewhere around 30 miles into the race) and I told the guys I needed to stop and stretch…..it felt soooo good to sit. My legs were starting to bark literally from my toes all the way to my lower back. I knew I was way out on a limb physically and I had to keep stretching and giving my legs any microbreak I could. We finally got down from that perch to the lake around mile 34 and I knew we had a few miles of downhill. Because of the pouding and the deceleration, downhill is not really any “easier” on the body, than uphill, it’s just typically a bit faster…….so from this point to the food/aid/bag-exchange station at 38-ish we cruised. I was so happy to get there. A folding plastic chair never felt so good. I promptly sat down with my bag, changed my shoes (which felt AWESOME), got some fluids down (I was not on the slightly dehydrated end of the spectrum), stretched and took some fuel for my pack. I stretched again and then told the guys we had to go or I’d be staying right where I was……we got up and kept moving. I knew we had some additional ups and downs ahead of us, but at this point we were doing more down than up overall……which was TOTALLY OK w/me. We made our way past a big section of rock-climbers (pretty cool to see) and slowly moved up the final hill trying to keep the body temperature in check as things were heating up. We eventually made it to the mile 42.2 aid station and filled our packs as this was the final station before the finish line. At this point 7.8 miles doesn’t seem so far. I kept telling myself that…..but it was far. My legs were now talking back loudly and although I wouldn’t call it pain (per se), it was significant discomfort on most steps…..by the end of mile 44 we got to the last real uphill coming into mile 45. For some reason the course markings threw us off a little bit at that point, we were going up a fairly significant grade (even though a pretty short one, it was a big challenge) and a few teams that we had passed were sneaking up on us, something that the inner competitor never loves. I could feel myself going from guy out having a good run, to competitor starting to toe the line between anger and mental implosion. I said to Nick “are you sure we’re going the right way? I’m going to be so pissed if we are climbing this hill for nothing”……he assured me that we were on the right track. Joe and I were not so confident. 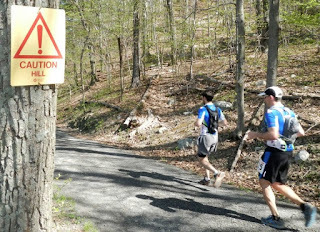 We kept climbing……at about the time when we saw the mile 45 marker, a husband and wife team that had been gaining ground on us caught and passed us. It is never a great feeling to know how hard you’re working and then feel like someone else has your number and even though this race was a very friendly and cordial racing element, it was still a race……and we just got passed. We regrouped a little and at about the same time saw that we were about to catch up and pass a team that we had been cat-and-mousing all day but had seemed to keep their distance on us for the last several miles. That was all the boost I needed, we got to the top of the hill and started to jog. I don’t know if it was adrenaline, or the fumes of the “diva” moment I was experiencing or what, but I felt like I could run……so I did. Joe and Nick went with me and we chugged along at a much faster clip than we had run in a while (maybe all day, or at least it felt that way). We passed both the team that we were pursuing and the team that just passed us. We were pushing it a little too early and they guys knew it, but I kept going and urged them to keep up….that we were going to put a few minutes into the competition and get this thing finished…..and they did. Joe eventually took the lead for a while and we kept chugging along at a solid clip. It felt so good to run…..even though we all knew we’d pay for it some. We were not at all sure we had made up enough time to stay ahead of those two teams……but at this point, we wanted to cross first. We alternated jogging and “shuffle-walking” with an additional stretch break thrown in. We got within a mile and 1/2 of the finish and my achilles tendon was starting to yell now…..we kept pushing and I was fading. I just focused on keeping up with the guys and kept calculating how much distance was left. Every tenth of a mile felt like an eternity and with about three quarters of a mile left we saw that one of the teams behind us was making a move. They were about 500 yards behind us. We needed to start moving. We jogged, got to the end of the road just about to enter the final quarter mile and they had gained on us, but we would be able to finish EXCEPT…..we missed the signage and somehow took a wrong turn. NO! This was not happening. We yelled across the road to an older gentleman sitting in his front lawn and asked if he knew how to get to the finish. He just looked at us. We yelled again and he said he had seen a runner go up that way……and then she turned around. Thanks for nothing! I was going into implosion-mode again. Then Nick spotted a sign at about the same time that Joe flagged a cyclist……..we figured it out and got back on the dirt road. It was a final uphill and we still had enough distance on the team behind us. We jogged and I could feel myself getting emotional. I was thinking about my family and my kids……and the unmistakable “DADDY” shriek I’ve been so accustomed to hearing from my kids on the race course. I knew they wouldn’t be at the finish line, I had told Lindsay it wasn’t worth the trek, but the mental oasis and subsequent emotional roller coaster propelled me those last couple of hundred yards. We crossed the finish line and Todd Jennings was standing there with a big smile on his face. 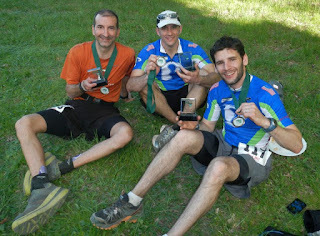 He asked Nick and Joe (the experienced ultramarathoner) how it was and they complimented him on the great course and amazing experience it really was. He looked at me (the newly crowned ultramarathoner) and said “you doing OK Mike? You look pretty tired”. I simply said “I am” and proceeded to sit down in the nearest grassy patch I could find…….getting off my feet was GLORIOUS……and I just sat. A few minutes later Todd came by to present us our medals and then leaned in and said “I’ve got some bad news for you”. I thought he was serious…..that maybe something bad had happened. “You guys are the third team to cross, you took THIRD PLACE!”. “What?” I said. “Are you sure?” I followed. I couldn’t believe this was possible. We were ahead of our projection by 30-60 minutes depending on who’s expectation……but it certainly didn’t feel fast. “Yes, you guys did great……I’ll go get your award”. I couldn’t believe it. We snapped a couple of pictures and I laid back in the grass and let my legs stretch……they were sending a simple message “You’re going to pay for this”….but I didn’t care. It was an incredibly satisfying finish to a very challenging day and months of not being at all sure I’d get to enjoy that moment. So, with a very cranky left achilles, some quadriceps that are waging a mini pain war, and a generally tired body, I say thank you to my family and friends for believing in me, my racing team (Nick and Joe) for pulling me along and getting me to the finish, to Joe for taking great pictures along the way and to all the incredibly generous people who donated to this adventure. You were part of something very special for me, not to mention part of a group that raised nearly $100K for “One of Earth’s last great places” and I will treasure the fact that you had a part to play in it. It’ll be a while before I try another one of these on for size, but you never do know.